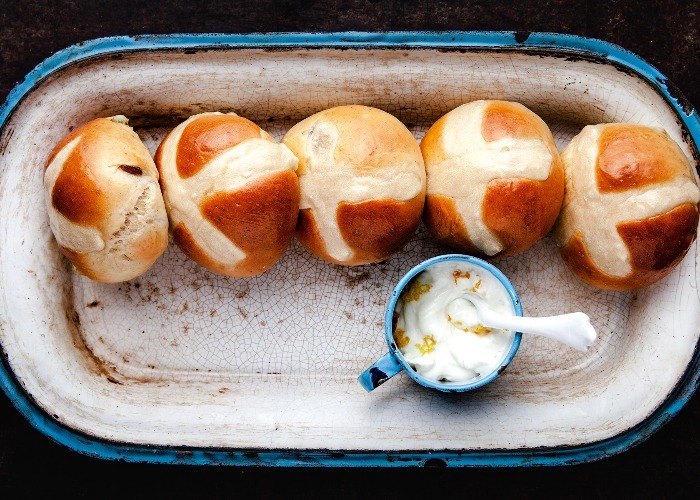 Traditionally a Good Friday treat, no Easter is imaginable without hot cross buns. This classic recipe incorporates mixed peel and raisins as well as lemon and orange zest but you could swap it for cranberries or even chopped nuts. Packed with soft, mixed fruit, they're wonderful toasted with lashings of butter. Melt the butter and add the milk. Let the mixture cool until lukewarm. Put the rest of the bun ingredients in a mixing bowl. Add the butter and milk mixture and knead into a fine dough. It should break away from the edge of the bowl. Cover the dough and leave to rise for an hour. Meanwhile, finely chop the mixed peel and mix in with the raisins. Once the dough has risen, knead in the dried fruit mixture and form 12 small balls (like bread rolls). Place on a baking tray lined with baking paper or in a greased dish and let them rest again for 30–60 minutes. Pre-heat the oven to 170°C/350°F/gas mark 4. For the topping, mix the flour and water into a paste and put in a freezer bag. Just before baking, cut off a corner of the bag and pipe a cross over each bun. Bake for about 15–20 minutes until golden. While the buns are in the oven, heat the apple jelly (or the apricot jam) until runny. Once the buns are out of the oven, use a pastry brush to glaze with the apple jelly and leave to cool. Recipe and image courtesy of Microplane.